Meet Steele and Hallie, both recently turned 1 year old, they are such little sweeties and are regulars here at the studio. 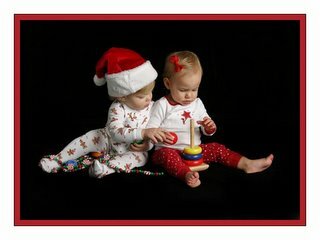 No they aren't twins, their mom's are good friends and wanted their picture made together with their Christmas jammies. We had a wonderful time and got a lot of really good images, but this one I was particularly fond of, to me it shows them in a quiet moment, sharing a toy, completely oblivious to my camera, while both mommies, who at this time were performing their own little performance to keep the babies entertained. They resorted to doing what they do best, play! With such a busy December, I had a lot to choose from, and I've chosen this one because of the simplicity of this capture and to me it's a very sweet moment. It was also a favorite of the mommies!